The most interesting monuments of history are: 40 meters high mausoleum of Sultan-Sanjar-Dar-al-Akhir (1140 A.D.), Sultan-Kala, Shazriar-Ark citadel, wall remains of Abdulla-Khan-Kala (XV c.), ruins of fortress and towers of Bayaramali-Khan-Kala, ruins of Kyz-Kala fortress (VI-VII c. AD. ), mausoleum al-Khakim-ibn-Amir-al-Djafari and Burayd-ibn-Hussein-al-Islami (XV c.) place of pilgrimage, Muxammad-ibn-Zeyd mausoleum (XII c.), Talkhatan-Baba complex with the mausoleums of Talkhatan-Baba, Imam Kasim, Imam Shafi and Imam Bakr of the epoch of the Seldjuks, Yusuf Khamadani mosque (XIII c., reconstructed in XIX c.), Erk-Kala fortress ruins (VI c.), ruins of Christian temple and Buddhist monastery in Gjaur-Kala (ancient Antioch Margiana), ruins of Beni Makhan mosque (Friday mosque, VII-XII c.c. 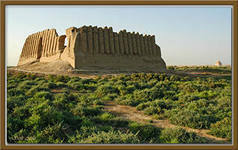 ), high walls of similar fortress construction of Big and Small Kyzyl-Kala, Kyz-Bibi mausoleum and also numerous remains of baths, palaces, ceremonial halls and other constructions. There are also the mausoleum of Dandankhan and Talkhatan-Baba mosques (XII century, at 30 kilometre's distance from South-east of Merv), keshk (fortified house) Akuyli-Koushuk (IX-XIII centuries), Kharam-Keshk fortress situated at 7 kilometers to the North of Gyaur-Kala (IX-XIII centuries), Durnali fortification situated at 25 kilometers to the North of Gyaur-Kala (I-II centuries), Gebekly fortification situated at 32 kilometers to the north-west of Gjaur-Kala. Today, many archaeological findings which were discovered during excavations of ancient towns are exposed in excellent Historical Museum of Merv.